For sewing enthusiasts, fall is so much more than a lovely season with great weather and gorgeous foliage. Fall is the start of the holiday-gift-sewing-season! It is never to early to dive into the Christmas gifts and décor projects. Jump start your holiday sewing with this exciting poinsettia embroidery pack by Amazing Designs. The embroidery bundle includes 26 designs for 4″ x 4″ hoops and 14 designs for 5″ x 7″ hoops. Making festive holiday décor and gifts is easy with Creative Quilting Outlines…Charming Poinsettias. Adding color to your embroidery design couldn’t be easier with the appliqué options in this design bundle. The detail and depth achieved by layering fabric, thread, and embroidery outlines makes these appliqué accents shine. I enjoy mixing and matching embroidery motifs to create more interest within the project. This pack has plenty to choose from and allows me the freedom to select whatever I like, knowing it will already coordinate with the many other designs. Three similar holiday wall hangings make quite a statement with colorful detailing in each embroidered and quilted stitch. The coordinating placemats are equally easy to create by simply adding the holiday embroidery designs to 6-1/2″ blocks, which will be sewn into a basic 9-patch quilt block and also set on point. 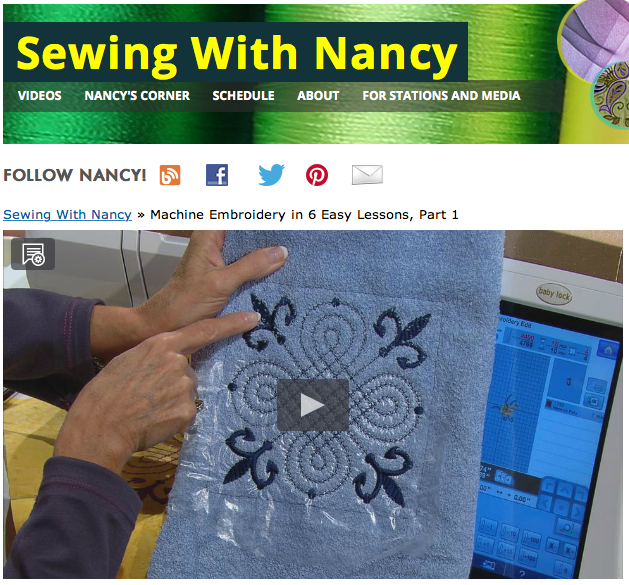 Polish your embroidery skills by watching Machine Embroidery in Six Easy Lessons Part One and Machine Embroidery in Six Easy Lessons Part Two, with guest Eileen Roche. On what type of holiday gift item are you most likely to add embroidery? Leave your answers in the comments section to be entered to win Creative Quilting Outlines…Charming Poinsettias. A winner will be randomly selected. Just gorgeous project !! I will have to get this CD winning is awesome thou LOL . I will embroider on fleece blankets and Christmas stockings. I would embroider Christmas stockings and placemats. were can I find the patterns for all of these projects. I see were I can get the design CD. I like to embroider on towels and kitchen linens. I would do a table runner and placemats it would make a great Christmas gift. Thanks so much for the giveaway. I think the designs would look great on table runners, pot holders or pillowcases. Thank you for the opportunity to win. I would use them on table runners and pot holders. Thanks for a chance to win. I think towels and tablecloths. Poinsettias are my favorite for holiday decorating. I love to add embroidery designs on many different items, including table runners, placemats, napkins, towels, and quilt blocks. Thanks for the fantastic giveaway! Napkins, table runners and towels are my most likely choices. pillow cases, pillows and towels. I decorate my house with just poinstettias for Christmas. I have Many artificaial Poinsettias around the house, lighted poinsettia garlands on the mantel and would love this design pack to make runners and a mantel scarf. What a wonderful design pack! I love Christmas and would do holiday table linens, table runners and door hangings. Quilting in the hoop would be fun too. This looks like such a fun collection. I LOVE placemats and napkins. They make great gifts. You name it and I’ll embroider it! Napkins; table cloths; table runners; placemats; towels: kitchen, bath, etc; purses; clothing; accessories of all types; Christmas tree skirts. I LOVE to embroider and my gifts show it. The appreciation on the eyes of the recipient warms my soul. I am just getting started I would love to make gifts for others this Christmas. Thank you for all you do ! I would use these designs on place mats and a table runner. Thank you for the opportunity to win these embroidery designs. I have not tried embroidery in the hoop. I was trying to come up for gifts for co workers and the ease of embroidering it all in the hoop would make it a fast and fun project for gifts. I would do table linens or Christmas stockings. This is such a pretty collection of designs! I’m making Christmas kitchen towels for my new daughters in-law and a mantel scarf for myself. I want to make a mantle scarf. I see myself spicing it up with metallic threads. Wouldn’t that be beautiful Nancy? I would love these designs to make the wall hangings for Christmas!!! These are beautiful designs! Thank you for the opportunity to win this collection!!! I like to add embroidery to kitchen towels and kitchen items. I make tree skirts and would use these designs to embellish a tree skirt. I will usually do dish towels. My husband even likes me to do some embroidery on towels that I keep in the house. I am making a bag that I would like to put a monogram inside. I have also done towel hangers, towels and magnets. I love to embroider on tea towels and linen doilies for gifts, and pillows to decorate for the holidays. Thank you for the great giveaway. I love doing dishtowels for people. I’d make the table runner, place mats and napkins for hostess gifts for all the parties we go to in December. Most likely I will be embroidering bath towels and tea towels. I love the poinsettia collection! I love to embroider hand towels, then give them as gifts and I donate some to the local food pantry. Of course, I just have to keep some for my home as well. Tree ornaments for Christmas are my favorite to embroider. Mug rugs! Mom always made each of us a new quilt for Christmas. I’m trying mug rugs! More my size! Mom always made each of us a new quilt for Christmas. I’m. Trying mug rugs! More my size! I love making napkins for gifts. These designs would make a table very festive. A tee-shirt for every one. Lovely Christmas designs. I would make a table runner for my son and daughter in law’s new ( to them) dining room table given to them from a distant relative. I would also make a table topper for the relative who was so generous. Embroidery would be great on holiday bibs for my mother who is in a nursing home after a devastating stroke. She can’t talk now but her beautiful smile shows she loves special holiday items. That would make her feel super! I would love to make holiday towels for our home. In addition, all three of my grown children could benefit from holiday towels with their family name on them as well. They make the holiday more beautiful with the poinsettias all around. I have embroidered a set of cloth napkins, each with a different Christmas motif. I have also given bread towels for different holidays. It is always mice to find new designs. I would love to use these designs on Christmas pillows for…everyone! I would put it behind glass and hang it on the wall to display for yrs to come. It’s some to pass on for generations to come ! What a great collection. I can see me making towels, napkins and a table runner to match. With so many designs, it would be hard to stop at one project! I would do pillow covers as they can be changed during the seasons and holidays. I think they would be beautiful on a sweatshirt or ultra suede jacket. Really neat going down the leg of a pair of jeans for some Christmas pizazz. I do a lot of embroidery on sweatshirts & scarves for Christmas gifts. These are very pretty designs! Thanks for the opportunity to win them. I would use these designs on fingertip towels, guest towels as well as table linens. Look like some wonderful designs. Last year I made those wonderful napkins in a circle that you taught us, Nancy and sent them away to my family, carefully folded in the napkin shape. I was quite surprised to see the photos of the Christmas table with them used as placemats under each plate. Maybe I should do a table runner this year in hope of no misunderstanding! I like to embroider hand towels with Christmas designs. Most probably the different table linens. It seems that it’s such a small holiday accent that has Hugh impact on that special day. I would like to make table runners, placemats, napkins and mug rugs. I love the Christmas motifs. It is difficult to decide on one specific gift. I love to make bags, table linens, decorating bibs for senior citizens in nursing home and personalize gift bags. I really enjoy my embroidery machine and love giving gifts. I love the holidays and I would love to try your inspirational priojects! You have always been a inspiration to me! I love cartoony embroidery … Especially to give on a towel, everything is so serious..Why not be a little less serious and have fun ? I love to make embroidered holiday towels for friends and family. Tea towels on huck toweling or terry make wonderful kitchen decorations and are useful as well. I have used Amazing Designs Christmas Cardinals design pack and have had great results. Would love to try this mix and match outlines and applique pack for quilted gifts. I would use it most on table linens. Maybe change the colors for different seasons to get a different look. I would use these designs on table centers, runners. Also, like the placemats, napkins. Love, love poinsettias. I would use these designs on table centers, runners. Also, like the placemats, napkins. Love, love ponsettias. I want to make some wine sacks to give a gift of wine to my book club friends. Next week I am making a start on putting together an Advent Calendar as I have found someone I haven’t made one for! I like to do towels,table runners,bags,mug rugs. I just love embroidering!! I will be doing some little elf boots to hold goodies, two wall hanging Christmas trees for people who can’t have a real tree and a tree skirt. I have been embroider snow man faces on TP and make a hand towel to go along with with it! I’m actually planning on adding embroidery to a tree skirt and also make a mantle scarf. I have been shopping you for year. Many years age, shen my son was a toddler( he’s 39 now) I tried to get him in Wrangler jeans to please his cowboy Dad. Came up with idea to put elastic in the back waistband. You published my tip and gave me a set of your sewing books. I still have the books and use them often. You are great! The poinsettia is my mothers favorite flower, would like to put a pretty design on a sweatshirt for her. I intend to make reusable fabric gift bags with embroidered designs. I like table runners and place mats, which I give at Christmas to family. I like the idea of quilting motif along with the embroidery. My favorite holiday items to make & embroider are table runners . They make perfect gifts ! Thanks Nancy – I would be honored to win this package !! I love using holiday designs on tea towels. I make different ones every season and give them as gifts. They are always well appreciated! I love to make napkins for family & friends. There are so many wonderful fabrics that it is a great chance to personalize each gift and the wonderful embroidery designs make them even more special! Thank you for the giveaway. I make table runners and towels.. I love to make special, personalized gifts for my family for Christmas. I usually make napkins and table runners. I have seen the mantle covers and would love to do a set of those for my son’s home using the Charming Poinsettias. I would do a tablerunner. Thanks for the great giveaway.